To fully appreciate the lives of spiders, which at first appear so far detached from our own, it is worth noting their fascinating evolutionary history. Did you know for example that, unlike insects, you can find spiders in the sea? True we do not have access to the deep blue on Whiteknights but the near cousins of the sea spiders can be found wandering, climbing, scuttling and jumping all around us. Spiders are arachnids and thus belong to the subphylum Chelicerata along with scorpions, mites and ticks. This is due to the presence of chelicerae, modified limbs prior to the mouth, which in spiders act as fangs to deliver venom. The subphylum Chelicerata is part of the arthropod phylum along with the hexapods (insects), crustaceans and myriapods (millipedes and centipedes). The fossil record for spiders is unfortunately lacking due to the soft nature of their exoskeletons. 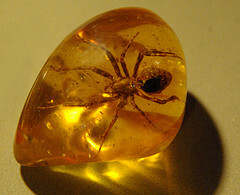 On the upside though amber deposits harbour many new species perfectly preserved and up to 6% of organisms identified in amber are actually spiders. Approximately 1150 fossil species have been described, constituting about 2.6% of all those currently described, and so by quite some margin spiders are the best represented fossil arachnid group (Penney, et al., 2012). Recent analysis of chelicerate fossils dates the oldest to be from the end of the Cambrian period (around 500 million years ago) when they inhabited the sea (Dunlop, 2010). It is currently thought that a scorpion from the Silurian period is undeniably the first arachnid but the debate as to when arachnids first conquered the land and on how many occasions is ongoing. Evidence gathered on the book lungs (breathing apparatus) of arachnids from multiple studies provides a strong case for this structure having evolved in the ancestor of arachnids. It is therefore implied that only one land conquering event would have taken place because book lungs would not have had to develop multiple times. Investigations into developmental biology also suggest spiders, scorpions and their relatives form their book lungs in similar ways. This theory is not definitive as research is still being carried out into whether the book lung could have evolved separately in spiders and scorpions but has come to function in a remarkably similar way (Scholtz and Kamenz, 2006). Studying evolutionary history is always going to throw up surprises especially when new fossil sets are uncovered or mitochondrial gene analysis provides conflicting results. What is important is that study in this area is dynamic and the researchers involved are receptive to new ideas as a collaborative approach between different fields of biology becomes more prevalent. Dunlop, J. A. (2010) Geological history and phylogeny of Chelicerata. Arthropod structure & development, 39(2), 124-142. Penney, D., Dunlop, J. A. and Marusik, Y. M. (2012) Summary statistics for fossil spider species taxonomy. ZooKeys, 192, 1-13. Scholtz, G. & Kamenz, C. (2006). The book lungs of Scorpiones and Tetrapulmonata (Chelicerata, Arachnida): Evidence for homology and a single terrestrialisation event of a common arachnid ancestor. Zoology, 109, 2-13. This entry was posted in Animals, Spiders and tagged Evolution, Spiders, university, whiteknights. Bookmark the permalink.